First Christian Church - SERMONS - Shine! In the beginning, God said, “Let there be light.” And there was light. 1John 1:5 says God is light, and in Him there is no darkness at all. Intellectually, this means the knowledge of God is light. Morally, this means the holiness of God is light. Physically, this means the glory of God is light. During the past weeks, we looked at the Beatitudes. They are the character qualities we will possess as we are conformed to the image of Jesus. Then Jesus said we are the salt of the earth. Jesus wants us to see the relationship that His disciples are to have with the world. Like salt, we are to season, heal, purify, preserve, and make people thirsty. Then Jesus said, Matt 5:14-16 You are the light of the world. A city on a hill cannot be hidden. Neither do people light a lamp and put it under a bowl. Instead they put it on its stand, and it gives light to everyone in the house. In the same way, let your light shine before men, that they may see your good deeds and praise your Father in heaven. When Jesus says that we are the light of the world, it means God has deposited His light, the Holy Spirit in us, and we are to let it shine. We live in a dark world, and while we are here, we are to disseminate His light into the darkness! After all, making decisions in the dark can lead to some regrettable consequences. I think it is safe to say that every bad decision we have ever made, we made it without the light of God. Light removes darkness, reveals danger, illuminates our path, and shows blemishes. When you look at something in the dark, it does not look so bad because we can’t see it clearly. John. 8:12 When Jesus spoke again to the people, he said, "I am the light of the world. Whoever follows me will never walk in darkness, but will have the light of life." Apart from Jesus, we can do nothing, because Jesus is the real light of the world. Since we are not the source of light, we only reflect the light of Jesus, like the moon reflects the sunlight. The Holy Spirit is our source of light and we are to reflect that light to others. By obeying God’s Word and the leading of the Holy Spirit, our lives reflect the mind and will of God! The light will expose that which is not truth! If we are going to reflect the truth and expose evil, then we need to conduct ourselves as Christ’s followers and diligently work to stay near to Jesus, our source of light. This is why Jesus tells us to follow Him, and why we are told to be holy, and why we are told to do His will and obey His commandments. We are the Jesus, who is the Truth, that people will see. The first Bible some people will ever read will be the Bible of our life. The first sermon they will ever hear will be a sermon we proclaim by our life! We are writing a gospel, a chapter each day by the deeds that we do and by the words that we say. People will base their thoughts about Jesus by the way that we conduct ourselves, or the kind of light we reflect. 1 Pet 2:9 But you are a chosen people, a royal priesthood, a holy nation, a people belonging to God, that you may declare the praises of him who called you out of darkness into his wonderful light. Jesus told his disciples, that like a city on a hill or a lamp in a lampstand, it is the duty of a Christian to stand out—not for prominence sake—but for the spreading of the Gospel, as a light in a dark world. How do we reflect the light? Do we go up to someone and just tell them that we are a Christian, and that they are going to Hell if they don’t become one? That approach is like shining a flashlight in someone’s face. It makes them turn away from the light and close their eyes. No, we are to reflect the light of Jesus through our example and our good works. People will listen to what we believe if our actions demonstrate our faith. 1 Pet 2:11-12 Dear friends, I urge you, as aliens and strangers in the world, to abstain from sinful desires, which war against your soul. Live such good lives among the pagans that, though they accuse you of doing wrong, they may see your good deeds and glorify God on the day he visits us. The proper motive for reflecting the Light of Jesus Christ is not that we may be seen, but that our Lord may be glorified. There is a natural and proper time to tell people why we live and do the things we do. People need to know that what we do, we do for the glory of God! Otherwise, they will be suspicious of our motives. It will seem that we are self-serving or self-glorifying. 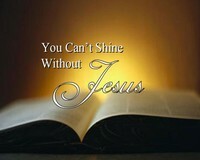 In order for us to effectively shine, the light of Jesus Christ needs to be consistent in our lives. Off and on Christians are not effective lights. We should reflect Jesus brightly every day of the week and everywhere we go. That sounds like an impossible task. How do we accomplish that? 1. People are seeking the truth, something real, some purpose for life. Jesus knew we would not be perfect reflections of His Light when He declared we are the light of the world. That is why our light shines when we are humble, apologize for our mistakes, admit our sin and imperfections, and proclaim Jesus as our Savior, Redeemer, and our righteousness. We lift up Jesus as the Way, the Truth, and the Life, not ourselves. We emphasize His forgiveness, mercy, and grace to overcome our weaknesses. 2 Corinthians 12:9-10 But he said to me, "My grace is sufficient for you, for my power is made perfect in weakness." Therefore I will boast all the more gladly about my weaknesses, so that Christ's power may rest on me. That is why, for Christ's sake, I delight in weaknesses, in insults, in hardships, in persecutions, in difficulties. For when I am weak, then I am strong. Furthermore, the light of Jesus shines if we respond like Jesus during tough times, persecution, and when facing death. There must be a reality to our faith in the storm and valley for others to want what we have. Anyone can smile on a sunny day. Oh, I’m not saying to be a fake. That will only hinder our effectiveness at causing others to want what we have. But we will have to show them a faith that conquers if we expect them to believe. If we don’t reflect peace, joy, love, and all the fruit of the Holy Spirit when facing a trial—if our faith is not working for us—why should they believe following Jesus will do anything for them? 2. Be filled with the Holy Spirit. When the Holy Spirit controls our lives, His fruit, the character of Jesus Christ, is reflected in us. Gal 5:22-25 But the fruit of the Spirit is love, joy, peace, patience, kindness, goodness, faithfulness, gentleness and self-control. Against such things there is no law. Those who belong to Christ Jesus have crucified the sinful nature with its passions and desires. Since we live by the Spirit, let us keep in step with the Spirit. In the same way we identify a tree by the fruit it bears, Jesus said we will be identified by our fruit. Jesus didn’t say that people will know that we are His disciples by our church membership or political affiliation. It isn’t by how we dress, or how long our hair is, or whether we are pierced or tattooed. 3. Instead, He said in John 13:35 “By this all men will know that you are my disciples, if you love one another.” Love is a way that people will associate us with Jesus. These two things, our behavior and our love, have to go together. We can be completely righteous, but if we don’t show love, it’s like covering our light up. On the other hand we can love everyone, but not be obedient to Christ, and that puts our light out. There was a time when you could see the light shining from the Church, or from the folks who were in the Church. Members of the Church were living right and doing right, and loving one another unconditionally. They were letting their light shine and you could see Jesus reflected in their life. During those periods of great revivals, society benefited from the light of the Church. But, something happened. People in the Church stopped being humble and became snobbish and hypocritical. They stopped obeying God and letting their light shine. They stopped loving one another and other people like they used to love. Members stopped praying and depending on God like they used to do. The Church became nothing but a social club because it stopped seeking the Holy Spirit and started keeping to itself. People stopped caring about, checking on, and helping brothers and sisters in the community. While the Church still supported missionary efforts in the world, it stopped ministering to the local community to spread the Gospel. And sadly enough, all of the problems didn’t come from the pews. Shepherds stopped feeding the sheep the truth. Preachers stopped preaching the Word of God and began talking about current events and social issues. They stopped presenting the Bible as infallible and introduced doubt, scientific theories, and nullified the miracles and power of God by teaching that those things were for back then and no longer happened today. Today, preachers are being caught stealing money from the church. Too many preachers are being caught sleeping with somebody else’s wife or somebody else’s husband. Yes, I said somebody else’s husband. No, I’m not talking about woman preachers. I’m talking about homosexual preachers who are living lives that are an abomination before the Lord! 4. The situation appears insurmountable. What can one real Christian do in this dark world, amid the corruption of the Church? We live in a world full of grumbling, complaining, and arguing. We can individually shine just by not doing those things. If we are genuinely thankful, grateful, peaceful, joyful, praising God and blessing people, we will be noticed like a city on a hill. We will shine like stars in the universe. It’s time for the Church to get back to the Source of its Light. It is time to be obedient. It’s time to seek God and His Spirit, so we have power to be His witness and the ability to love one another and other people. It is time stop pointing fingers and go to the closest mirror and ask ourselves what kind of light we are reflecting! Some of us have lights that are shining like the light of a candle. When there is calm or when there is peace in the air, our light shines very brightly. But just as soon as there is a little turbulence in the air, our flame gets to flickering all over the place. We become unsteady and inconsistent in our faith and actions. Some of us have lights that shine like a flashlight. We give off a nice bright and crisp light for a while. But as time passes, our light becomes dimmer and dimmer. We don’t realize this gradual change, because we are slowly drifting away from Jesus Christ. We reflect less of His light the farther away we get from Him. We have ignored the Holy Spirit, our source of power and light. We are just like a flashlight whose power is going out and we need to be recharged. In summary, if we don’t have Jesus in our life, we don’t have any real light. It is only through Jesus, that we can receive the true light, the Holy Spirit, who will boldly and brightly shine through us. And if Jesus is shining in our lives, we are like a house on a hill, and we will always be seen. We don’t have to go out trying to be noticed, but somebody will notice us because our works will speak for themselves. What we are doing, if we are doing it in the name of the Jesus, will not only be seen by Him, but it will be seen by the whole world. We, as individual members of the Body of Christ, must understand that it’s not about us, but it’s all about Jesus. It’s not about our name being spread all over the land, but it’s all about spreading the Name of Jesus. It’s not about how many people come to our meetings, but it’s all about how many lives can be touched by Jesus as we go out into the world! Jesus said, John 9:5 While I am in the world, I am the light of the world. Once again, we cannot manufacture the light. When we are following Jesus, we will be in the light and we will reflect that light, just like a diamond reflects the light it is in. Until Jesus takes the Church home, He wants to shine in the world through us! Now, many people love darkness rather than light, because their deeds are evil. They will reject us like they rejected Jesus, but others are seeking the truth. Christians are here to shine as lights in this dark world so those seekers can find the truth—Jesus Christ. One more example: when we put up a new church sign we hoped to make the community more aware of us. However, you are the church’s most effective sign. Would you ever attend a church where the sign read, "Come to our church: we are a bunch of negative, conceited, argumentative, stubborn, obnoxious people"? Well, people don’t attend churches where the human church signs give the same message! Our lives should be reflecting Jesus so people know they will be in His presence when they come here. By our conduct, they should know they will be loved and accepted in our meetings. People would still be drawn to Jesus today if they could see His light shining in His followers! By associating with us, they should know God is a God of love by our love. They should know He is holy by our holiness. That’s why Jesus was so effective (and sometimes why we’re not). He showed love and holiness to everyone. He attracted followers by being kind, generous, unselfish, friendly, courteous, thoughtful, and—righteous. Since these are not natural characteristics of our sinful nature, we need the Holy Spirit of Jesus abiding in us, reflecting the character of Christ. Jesus helped people meet their needs, asking nothing in return. He was just as accommodating to lepers as He was rulers. He didn’t discriminate along racial or gender lines. He gave attention to Nicodemus, a ruler of the Jews in John 3, and to a Samaritan woman in John 4. Lastly, we think it is just a cute children’s song when we hear, “This little light of mine, I’m going to let it shine.” However, it has a serious message to those who wear the name Christian. That name means Christ-like. It is the Christian’s responsibility to die daily to our sinful nature, to be filled with the Holy Spirit, to reflect the light of Jesus, to have His character, to walk in His light, to use His gifts and His power. We are to glorify Him with our lives! So my brothers and sisters, let your light shine before men, that they may see your good deeds and praise your Father in heaven. If your light is dim, confess this to your Father in Heaven. Repent and He will forgive you and renew His Spirit in you. Maybe you can’t reflect any light because you are full of darkness. The dark is a scary place, but maybe you feel secure there, and afraid of the light. You don’t need to be afraid of Jesus. He is gentle, loving, and kind. He understands how you got where you are, but He also wants to save you from the destruction ahead of you. Jesus invites you to come into His light by repenting of your sin and accepting His atonement for it on the Cross. He paid your penalty so you can turn away from those things that bring death and darkness into your life. Let Him give you a new life through water baptism and you will be born again of the Holy Spirit. The life and light of Jesus Christ will be in you. Everything will appear brighter and you will shine as you reflect His light.